The Eta Aquarid meteor shower is now taking stage in the wee hours before dawn. 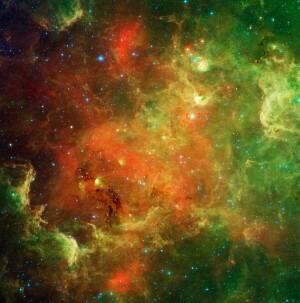 It has expected to peak in the predawn sky on Friday morning – May 6, 2011 – in the dark hour before astronomical twilight. Don’t know when astronomical twilight begins in your sky? Find out with this handy custom sunrise sunset calendar. Under ideal conditions, this shower may produce up to 20 to 40 meteors per hour. Even higher meteor numbers in the southern hemisphere. Luckily, the thin waxing crescent moon will set at very early evening, leaving dark skies for sky watching and the predawn Eta Aquarid shower. Although the more southerly latitudes have the better view of this shower, the more northerly latitudes are more likely to see the young moon after sunset today. The new moon occurred yesterday, on May 3, at 6:51 Universal Time. Why more Eta Aquarid meteors in the southern hemisphere? What is the youngest moon you can see? The point in the sky from which meteors in annual showers appear to radiate is called the meteor shower radiant. You don’t have to locate the radiant to watch the Eta Aquarid meteors, but people always ask about them. Although the Eta Aquarid meteors streak all over the sky, they appear to radiate from the Y-shaped group of stars called the Water Jar. The Water Jar is part of the constellation Aquarius. 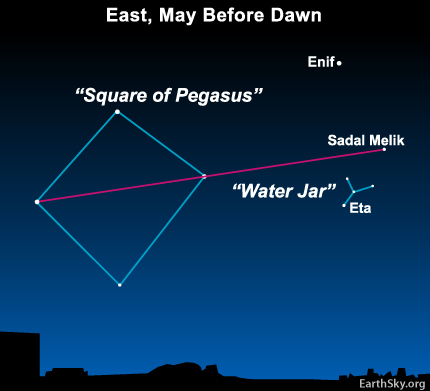 To star-hop to the Water Jar, first find the four stars of the Great Square of Pegasus. Looking eastward at about 4 a.m. (Daylight Saving Time), the Great Square of Pegasus glitters like a celestial baseball diamond. Imagine the bottom star as home base. Draw a line from the third base star through the first base star, then go twice that distance to locate the star . To the lower left of Sadal Melik is the small Y-shaped Water Jar, marking the approximate radiant of the Eta Aquarid meteor shower. Again, you do not need to know the shower’s radiant point to watch the meteors! During the wee morning hours before dawn, the meteors in this annual shower will appear in all parts of the sky. Previous Story: Bring the Kids to Carter Lake to Learn to Sail! Site contents copyright © 2019 Recorder Online	except as noted. All rights reserved. | 83 queries in 1.447 seconds.